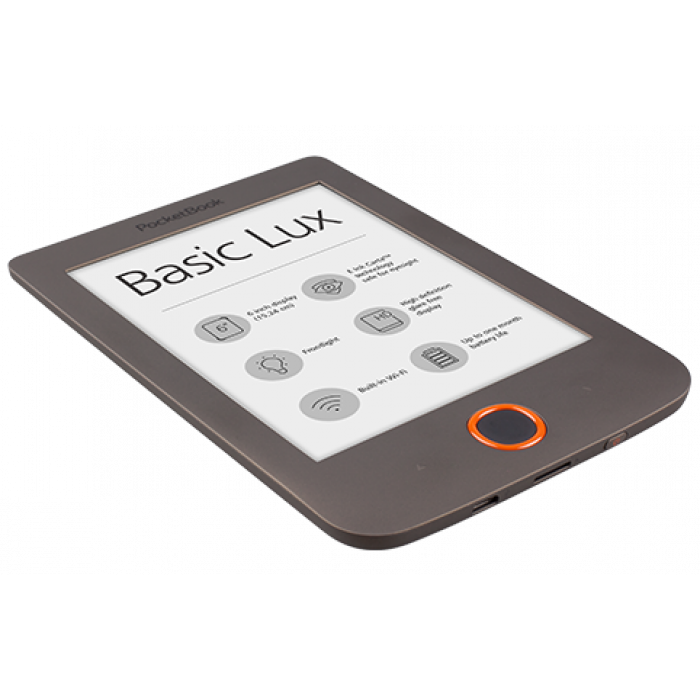 - with LED front light and 6-inch E Ink Carta™ screen with HD resolution (1024 x 758 pixels) guarantees high image contrast and reading comfort in any lighting conditions. Convenient size, ergonomic button-joystick, built-in Wi-Fi module, and preinstalled dictionaries - all characteristics of PocketBook Basic Lux are focused on the main goal: to ensure comfortable reading, in the "non-stop" mode, regardless of time and place. In addition to 8 GB of internal memory, the reader has a slot for microSD cards, which allows memory expanding to 32 GB. 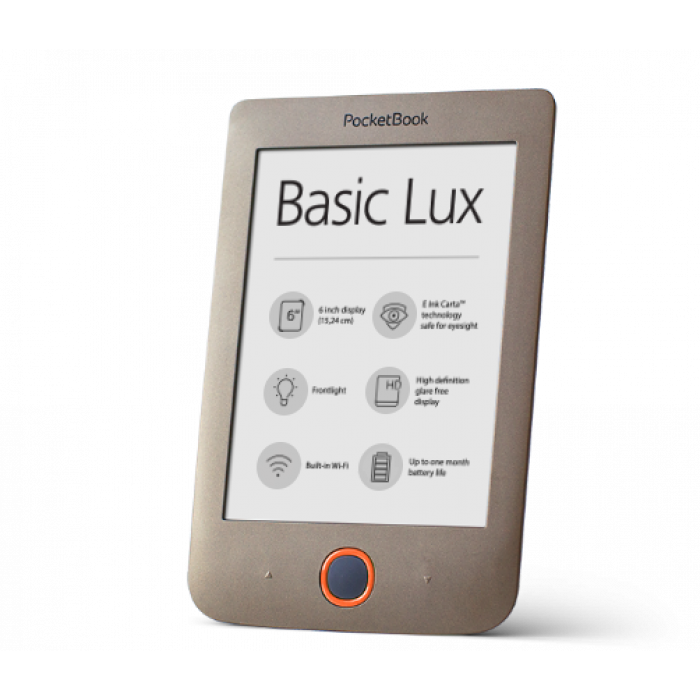 PocketBook Basic Lux may always be in user’s pocket, offering to choose a book from a virtual library, which may contain up to 2000 pieces. 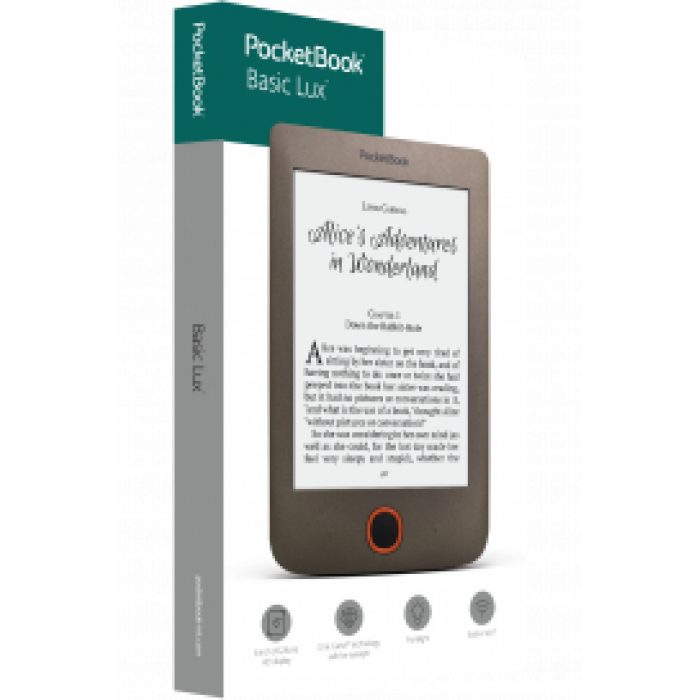 A pleasant bonus is 97 pre-installed free e-books in 14 languages, including 7 in German and 8 in English (5 in Dutch, 7 in Polish, 7 in Italian). The weight of the device is only 170 grams, and makes it sufficiently mobile and convenient for use both during rest and “on the go”. The e-reader is made in a classic dark brown colour, and will perfectly complements any style of the owner. Built-in wireless Wi-Fi together with Dropbox, Send-to-PocketBook and PocketBook Sync services allow to deliver any e-content to the device fast and easy, without having connection with PC. Providing maximum freedom of reading, the reader supports without conversion 17 book and 4 graphic formats, such as JPEG, BMP, PNG, TIFF. The preinstalled dictionaries are indispensable when reading foreign literature. 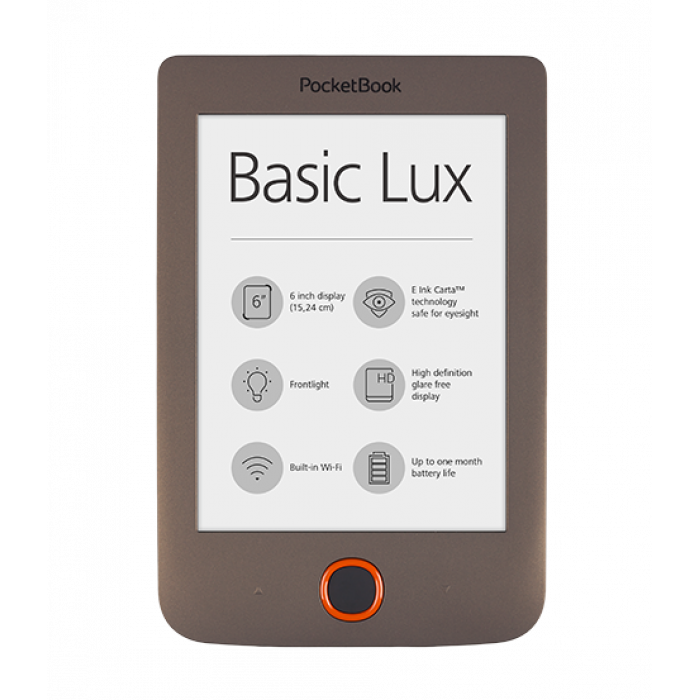 PocketBook Basic Lux – enjoy comfortable and exciting reading at any moment of life. Accumulator:	Li-Ion Polymer 1300 mAh, up to one month of battery life (may vary depending on usage mode, connectivity and settings).